Pity poor Matamoras, PA, population 2,600, located on the Delaware River where Pennsylvania, New York and New Jersey all come together. The town has only two named streets: Delaware Drive (parallel to the river), and Pennsylvania Ave. (perpendicular). Other streets parallel to the river are numbered: 1st, 2nd, 3rd, and so on, up to 10th. The avenues, perpendicular to the river, start with Avenue A in the north, and continue to Avenue S, in the south. Pennsylvania Ave., the main drag, is between “K” and “L”. What a boring little town! For another egregious example, consider Springfield, OR. The main street, imaginatively named Main Street, runs E-W, between South A Street and A Street. The other names are predictable: B Street, C Street, and…well, you get the idea. And, surprise, surprise, the N-S streets are numbered, from 1st all the way up to 75th Street (it seems there are no avenues in Springfield). Now Springfield, with nearly 60,000 people, does have a few more named streets than Matamoras (K Street has been renamed Centennial Blvd. ), but not many. Where does this sad state of affairs come from? I will guess it started in Washington, DC, where Pierre Charles L’Enfant was imported from France to design the city. He brought with him the malign influence of the French Revolution: an irrational belief in hyper-rationality. And so Washington is on a strict grid, with lettered streets running E-W, and numbered streets N-S.
Superimposed on this grid are streets named for states, most famously Pennsylvania Ave. To a very crude approximation, the States form a separate, looser grid offset by 30 degrees, though in reality they go every which way. Allegedly they provide grand vistas, and I guess they do. You’d have to tear down the Treasury Department to get the full effect. In my view, the lettered grid streets are boring, and the state streets are unpredictable. Thus Washington is simultaneously hyper-rational and nearly unnavigable – the worst of both worlds. Beyond the federal triangle it isn’t a very attractive city, either. So now consider New York City, or specifically, Manhattan. This appears even worse than Washington, what with all roads numbered. N-S roads (parallel to the primary axis of the island) are called Avenues, and are numbered from 1st Avenue in the east, the 12th Avenue along the Hudson. The E-W roads (along the island’s minor axis) are also numbered, designated Streets, starting with 1st Street (just north of Houston), and ending at 220th Street, at the northern tip of the island. 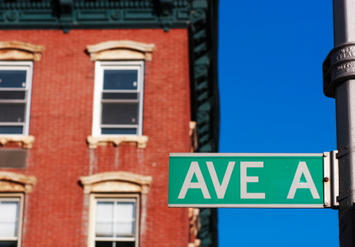 Thus the corner of 33rd St. and 3rd Ave. is a perfectly legitimate address, as could be 8th Ave. and 88th St. But unlike Matamoras, or Springfield, or even Washington, New York City works. Why? The Commissioners’ Plan of 1811 that platted the city of New York turns out to be a work of great genius. The key insight is asymmetry, or more accurately, anisotropy. Or, in colloquial terms that any New Yorker will understand, the difference between long blocks and short blocks. For in Matamoras, Springfield, or Washington (or Chicago, or almost any other city you can name), the blocks are square. But not in New York – there the blocks are rectangular at a ratio of approximately 3 to 1. The long blocks, between the Avenues, are approximately 6 blocks to the mile. The short blocks, between streets, are approximately 20 blocks to the mile. Note the word “approximate.” The Commissioners were smart enough to build in slight variations based on circumstance – no hyper-rationality here. It is impossible to exaggerate the importance of this fact. To pick a modest example, consider the Empire State Building. That building occupies half a city block between 33rd and 34th Streets on the west side of 5th Avenue (extending half way to 6th Avenue). This half block lends the building its unique aspect ratio – approximately 1.5:1 (close to the Golden Ratio). Think how much more interesting the architecture is than a building (e.g., the Sears Tower) forced into a square block. A square Empire State Building wouldn’t look the same at all. Instead, do you want a little side street? Pick a number – almost any number will do – between 1 and 220, and walk cross town. Pleasant, quiet and interesting neighborhoods await. There are a few numbers – 14th St., 23rd St., 34th St., 42nd St. – which, by the Commissioners’ design, are wider traffic thoroughfares, and impressive in their own right. New York has two other features worthy of note. One is Central Park, between 5th Avenue and 8th Avenue, from 59th Street to 110th Street. The facetious address I listed above (8th Avenue at 88th St.) doesn’t quite exist, for the Avenue along that stretch is known as Central Park West. But allowing for that difference, at 88th St. it would be a very elegant address indeed. The second feature is the country road along the Hudson that the Commissioners rechristened as a fantastic parade route. Today we know it as Broadway. It does not follow the grid, but instead starts at Battery Park and meanders its way north and west the entire length of the island. It intersects the grid at memorable locations: Union Square, Herald Square, Times Square, Columbus Circle, and more. Please don’t forget the Flatiron Building at 23rd St. (Madison Square). There’s more: I haven’t talked about Lower Manhattan at all, nor any of the wonderful things you can do, see and eat. But I’m out of space, so I’ll leave it here for now. I’ve never lived in New York City. Now that I live nearby, I take the train and walk the Commissioners’ streets as often as I can. Hope you can do that, too: New York is the greatest city in the world.